Offering gentle exfoliation, uneven skin tone and textual irregularities are top of the target list for this lightweight serum. Formulated with lactic acid (an alpha hydroxyl acid that offers exquisite exfoliation) and Tasmanian pepperberry (to reduce signs of inflammation), this trusty treatment stimulates cell regeneration to reduce pigmentation and improve overall skin texture. Offering gentle – yet extraordinary – exfoliation with lactic acid (an alpha hydroxyl acid) this lightweight serum stimulates cell regeneration to reduce pigmentation, diminish acne scars and age spots and improve overall skin texture. 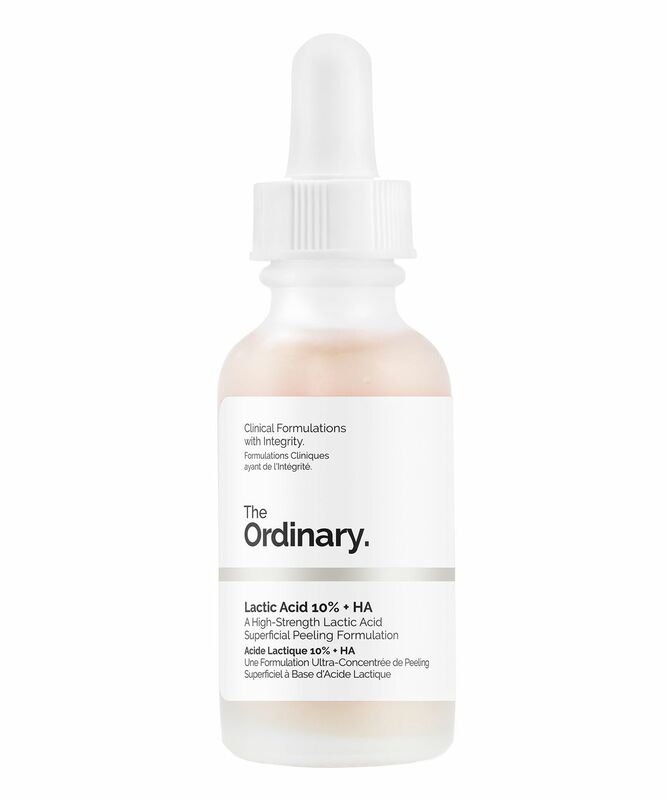 Don’t be perturbed by the irritation often associated with acid use – The Ordinary’s Lactic Acid 10% + HA contains purified Tasmanian pepperberry to reduce signs of inflammation and soothe the sensitivity sometimes caused by exfoliation. Also enhanced with heroic hydrating ingredient hyaluronic acid, this super-charged serum strengthens the lipid barrier to improve the skin’s ability to attract and retain moisture. I've started using the lactic acid in 5% because I was worried that it might be too strong. Have now switched to 10% since my skin got more used to it and I have sensitive skin. I like the glow it gives overall, but requires constant using to keep that glow. Wouldn't recommend using it everyday tho. I'm genuinely impressed by this product. It helped a lot with my blemishes, black and white heads, redness, huge pores, etc. I use it in combination with Niacinamide. I have experienced no side effects. Will definitely keep using it and add more products to my routine. Most importantly, I finally have hope that I could have even tone and I'm not ashamed to go out without makeup anymore - sun protection is obligatory, though. Thank you, The Ordinary, love you. Love it! My skin looks so much brighter and clearer after using this. Skin care staple for me. It is a great product and When I use it my skin looks so much better! I've been using this for a bit over a week now, and have noticed a huge difference in my skin. My acne is now under control and old acne scars have faded heaps! The product itself is really lovely. I find it quite gentle, despite it being the stronger of the lactic acid products from The Ordinary. I'm really enjoying using it and now consider myself a convert to The Ordinary products! I like it more then the Glycolic acid (which I won't repurchase). It's milder and my skin feels better after using it. I use this bi weekly overnight as I have dry/menopausal/eczema prone skin. Other nights I use the glycolic toner or my retinol serum, but never more than one a night. All my other products are moisturising/hydrating. This gives a good surface exfoliation on flakey skin etc whilst still being fairly gentle. I use a lot of oils/balms to treat dryness as well as a daily mineral spf. At these prices it's definitely worth a try. I bought this product because of really good reviews but to be honest this did not help me get rid of pigmentation/acne scars. I did use this for over 2 weeks but didn't get any good results, I normally don't leave reviews but this product didn't work for me and I was really disappointed as I had high hopes. Все получила быстро. Подожду осени и буду пробовать. "I received everything quickly. I'll wait for autumn and I'll try." My skin feels super soft and it hasn't been this way since adulting. I truly love it. A definite repurchase for me. For anyone who doesn't think this "does nothing". Try it out on an area of your body and see/feel the difference. Superb! Nothing happened at all. Extremely disappointed, glad I didn't spend a fortune. Still hunting for something that actually works !! OMG every morning I actually look forward to wakening up early JUST to feel my face!! Soooo smooth...highly recommend if you want to soft face. Started off with 5% as I was just getting used to acids and noticed an incredible change in hyperpigmentation caused by acne. Upgraded to 10% and was great at first but now I feel like my skin has developed a resistance to it as the results aren't as drastic as before. Would definitely recommend buying (especially for hyperpigmentation spots), but except for its efficacy to die down after a while. I have very rough skin, the absolute opposite of sensitive, and I use this acid for a bunch of things. I use it on my face to help even things out, I use it to prevent ingrown hair, I use it on my arms to help with keratosis pilaris. It is a bit drying so once it's absorbed I follow it up with a heavy moisturiser. I have two backups for when I run out. I use it for a couple of days now and my skin looks much better now. It still is gentle and a little goes a long way. Must have serum for dry & flaky skin! Well, truth to be told I have a very dry skin on my neck due to eczema. But the eczema is under control till now. So with this serum, it definitely helps in a slough off the dead skin cells and makes my neck skin smoother after one bottle usage. It's worth the bucks!!! I am seriously impressed with this product!! After using it for only two days I already noticed a difference - my skin looks smoother, redness and previous acne scars have already improved. It has also made my makeup look nicer by reducing pores. The fact that this product is so cheap also adds to its impressiveness! I have previously used the Sunday Riley UFO oil to try to help my skin and I can honestly say that this is way better! I would highly recommend this to improve skin imperfections. Amazing I use this along with the 100% squalane oil and I can see results after first use. I had the terrible dry skin I was prescribed steroid moisturisers as cream etc and this is the only thing that has gotten rid of it not only that my blocked pores have completely disappeared and my face feels the smoothest and clearest it has ever been highly recommended. It's pretty steady I guess. Not my favourite acid, but good. Reliable. I wouldn't say it works wonders, but it works. I'm a huge Ordinary fan. Used this religiously every night for about 3 weeks and my skin is so clear and even toned that I don’t want to cover it with makeup! I use this at night as it’s drying, wake up fresh-faced, even toned and glowy. I had big red painful acne on my cheeks and jaw which disappeared leaving only red marks, which I used the ordinary Alpha Arbutin 2% + HA on, which are pretty much gone now. I had tiny little bumps all over my forehead which are gone too. As for the dryness I use the alpha arbutin again as a kind of serum (?) idk if that’s what it’s for but it makes my skin even-toned and dewy so I don’t need foundation. Really pleased with these two products and they’ve saved my skin!!! I’ve just run out and I have to join the wait list for more, I’m going to stock up when it’s back in stock! Best skin care I have ever used! The skin was so much clearer! This stuff is incredible! My pores absolutely look smaller and have reduced within three days (I'm not even kidding, people have actually said there's a noticeable difference) and the dry dead skin around my eyebrows has basically gone. It seems to go a little quickly, but for the cheap price it's definitely worth it. Good texture and consistency, doesn't smell funny. Good price for starting to learn about and use acids. Does sting a little on open or fresh spots but nowhere else. Been using since the start of December and can't say I've noticed much of a difference. It's not a bad product, just personally can't see a difference so won't be repurchasing. Been using this for over a month as part of my night time skin routine and I’m so happy with the results. My skin is smoother and I have fewer break outs. I can even see a difference in my acne scars that I’ve had since my early 20’s. I will definitely be buying this again. This is my holy grail product! It has given me brighter, clearer and glowing skin and I love the tingling sensation when I put it on. I won't be without this product. Was a bit apprehensive at first because I have fairly dry/sensitive skin. But what I do is to mix a drop of this with hydrating gel before application. I've been using this product for less than 5 days and already I can see how much difference it has made for my skin. Never struggled much with acne but I did have some texture issues with my skin that this baby has cleared right up. My skin now looks way smoother, healthier, cleaner and more glowing. Will definitely be purchasing again! I am so happy that I picked this product as one of my skincare routines. My skin now is a lot better than I ever imagine. Thank you TO. I was completely new to acids before using this product (this is not advised though I understand and I took a huge risk not knowing how my skin would react) but luckily I experienced no irritation, uncomfortable or break outs. I noticed my skin was brighter and reduced the pores on my nose from first use. Will definitely be stocking up on this product when it's back in stock! This is a good peeling solution, gentle yet effective. But the smell..! Why nobody mentions it? It is not that strong but it is not pleasant at all. Since there is no fragrance listed in the ingredients I would assume it's the Tasmanian pepperberry extract that gives this serum this strange odor. I have really bad acne prone skin (which leads to deep discolouration + acne scars) and even take have medication to control it. I also have quiet sensitive skin and generally seem find I have an adverse reaction to most skin care/make up products so was obviously reluctant to try this, However this is probably one of the best products I've used in a while and its claims to 'diminish acne scars' are really met. I truly think this has been a life saver, it's strong enough to do the job but not too strong that it makes your skin raw or overly sensitive to other things you may want to put on top, such as make up. I have been using it for about a week now and have seen such great results. I have used this nightly for a week now and have seen a lot of improvement both in the texture of my skin and the lightening of acne scars. I also had texture and bumps on my elbows and this completely smoothed out those. 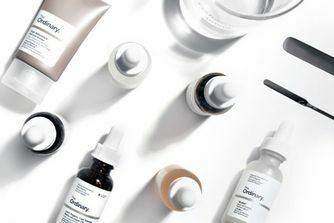 I like products from the Ordinary because they are simple and on point, no fuzz at all, just simple formulas with a really friendly price tag. I ordered this product because I like to switch up my acids, and basically just needed a fairly gentle exfoliator between my heavier ones. I never expected anything extra, but boy, was this formula a surprise. My skin was just instantly GLOWING after application. The Pixi Glow tonic is just nothing compared to this serum, which I believe can be used as a daily toner before application of other serums if your skin is okay with it. Will reorder for sure. Been using it every other day and I always find that it's softening on my skin. I don't see an extremely visible improvement the next day but I do notice that my skin isn't as great when I skip out on this in my week. In my opinion this is so far the best product I have used for my dull/open pore/blackhead prone/mature skin. I tend not to use it near my nose as it tends to make me breakout in a cold sore! On my second bottle, it's not a miracle but it does help keep my skin clearer than it would be without it. I love this product more than any other lactic acid I ever tried! It gives my skin good soft peeling and a bit of radiance! Just try! This product helps with cystic acne (nothing else has helped me). It is very gentle and not irritating on my skin. It has given my skin a healthy glow and helps my skin stay moisturised. I really like it and I will be repurchasing again. I love this stuff so much, never made my skin burn or irritate & the next day I have an incredibly lovely soft “new” feeling to my face which is nice. Only thing I did notice is I put this on one night before I was going out shopping in the summertime and I did notice a slight burn whenever the light hit me directly but that is a precaution on the bottle. Highly recommend. One of the first products from The Ordinary I tried. Such a great chemical exfoliant. Wake up to softer and clearer looking skin. Love this stuff. I never usually purchase a skin product again when the bottles finishes if I don't see results, but I will deffo be re-purchasing this. It has brightened my face and lightened my dark spots. I could see a difference in the first two weeks. Helps to dry out a pimple very quickly. Part of my beauty holy grail. This works better for my skin than salicylic acid. I bought this because I read it would reduce pigmentation. I definitely think it’s balanced my skin and reduced my pigmentation *slightly* but not enough for me to buy more, so plan on trying something else. Really brightened and cleared up my skin, staple. I have combination skin, that became prone to breakouts after I had an allergic reaction to another product. It left my skin with scars (I'm medium to dark complexion) that wouldn't fade no matter what I tried. This is the first acid I've ever tried and it has done absolute wonders to my skin. I use it in my nighttime routine and a tad bit goes a long way. Within the month that I've been using this, I've noticed that my skin feels more balanced in the mornings, not oily. It's helped a lot to fade the marks though they aren't completely gone yet. No glow though but no complaints! Would I buy it again? Absolutely! It's affordable and it really does work! Effective resurfacer for sensitive skin. Love this! Great acid for those on a budget! I am a huge fan of chemical exfoliators and have used my fair share of them. For a long time, the SR Good Genes were my go to, but when I saw this product I decided to test it out and see if they compare. I have seen no difference in the look, feel or texture of my skin since switching this, which is great! My skin is still smooth and glowing and doesn't seem to be missing Good Genes at all. I have been using it every day in the evening for just over a month and I am really impressed. I have now saved myself £74.20 on every purchase...delighted. I have sensitive/blemished skin and I purchased this product after reading all the rave reviews. I used this at night after cleansing my skin in hope to reduce and clear my spots. I did notice that it did calm my spots down, however, it didn't manage to eradicate completely or improve how my skin looked. I think it's definitely a good purchase for those with mildly problematic skin. I can't put this down: it changed my skin so much! After only three nights of using this, my skin looked brighter, more radiant and just glowing. Also, my pores seemed smaller. After using it for a week it started to dry out my skin a bit, so I layered it with a richer moisturizer and all is great now. Just ordered my second bottle, I'm hooked! I have been using it for around 3 months now and my skin is so much better than before. It helps to get rid of those small bumps on my face and makes my skin looks smoother and brighter. At first, I wasn't happy with this product. I figured out I was using it wrong - used on my skin after cleansing, kind of like the glycolic toner which I love and it made my skin drier and rough. But when I first use a hydrating toner and then apply this acid - it's a whole different story. After a week or two, my skin is visibly smoother and my pores are reduced. However, the glycolic toner works the same for me, is cheaper and less fuss. Started using this acid in my PM routine 4 days ago and already can see it has made a huge difference. My skin is the smoothest it's been since I can remember and the little bumps that I had on my forehead have completely gone. I do have some hyperpigmentation on my right cheek which I can see is beginning to fade, so I'm excited to see what will happen after another few days of use. I would definitely recommend this product, especially at such an affordable price too. This stuff is brilliant! I bought it because the peel was out of stock and this was cheap and I thought worth a go as an alternative and to see how it exfoliates. I wanted it to get rid of some mild acne I get around my mouth and nothing will shift! Well, I think it helped to reduce my acne although not get rid of it all, what I was amazed at is that it has got rid of the blackheads on my nose and chin! I am amazed! Nothing has ever been able to do that!! It's like it dissolves them away. I will definitely repurchase! Loving so much of the Ordinary products. Amazing price point and they WORK! I bought this product along with matrixyl to use in the PM before my night cream. I apply a few drops all over my face and neck (avoiding eye area). I have noticed a difference in my skin texture and tone. I have combination skin and a small patch of rosacea on my right cheek. My skin is clearer than it has been for a long time and pores on my nose are less clogged and appear smaller. This acid has changed my face completely. I just need a small amount to apply to my face and it has left my skin feeling bouncy, clearer and just all-in-all clean. I feel like I can tell it is making a difference on the actual skin itself. Love this product and it will last a very long time as you only need a small amount - bonus! Since I started using this, my skin has evened out in so many ways. Dark spots from acne scars or freckles lightened up, the redness that I have along my jawline and around my nose has nearly gone, and I have had these tiny bumps on my forehead for years that I couldn't get rid of but this acid did the trick! My skin is much more sensitive to sunlight now, but I've just taken to wearing hats and reapplying an spf during the day. This is a fantastic product for treating active breakouts -- really speeds up healing time. Good for improving the overall texture of skin too. Great product at an amazing price point! I am so impressed with this Lactic Acid by The Ordinary. I experienced no redness or breakouts, just radiant looking skin which then soaked up serums and moisturiser on the days I didn't use this. My skin looks fresh and radiant. I only used this twice a week in the evening, so the bottle seems to last forever. Some of these have arginine in them which is great for skin just as the arginine in supplements are, however, if u know u have any dormant viruses or are just sensitive to arginine then beware, that's why some people are having amazing results and comparing to good genes and others are having crazy breakouts. I have been using this at night for about 3 months and it has done wonders for my pigmentation (Melasma from pregnancy 10 years ago). I have tried various other treatments and none have caused a reduction in this product. I make sure I use a moisturiser with SPF and do take a break from it every few days. For me, this has been incredibly effective. I really like this solution. I use generously every night after cleansing and toning. It sinks in so quickly! LOVE!! A while back I started getting those weird pimples / clogged pores just below my neck. This definitely killed them! My pores, in general, are cleaner, smaller, still some clogged pores on my cheeks, but I have high hopes. Will definitely repurchase! purchased this a month ago and my skin GLOWS. I love a lot of products from this company & have used them for a few months. I ordered this at the same time but never used it as I was using glycolic acid and felt that was enough. I decided to use it on a whim one day after reading some positive reviews and haven’t looked back. My skin had broken repeatedly & I decided to give it a go, I used it for 5 days straight. The first night my skin purged and all the under the skin spots came out. By the 3rd night my skin was significantly clearer & by the 5th night it was flawless, glowy & my pores looked better than with any other product I’ve used. I found glycolic acid causes me to break out but this makes me easily as glowy and also clear-skinned. I now use it 3 times a week (alternate nights) & it has made such a difference to my skin. My absolute holy grail favourite. Honestly never used a product like this. I have had really bad hyperpigmentation for years and it really calms it down. For the price I am actually blown away by result, and I know it actually works as if I don’t use it for a few days my skin starts acting up again. This product is very affordable and yet it delivers. Some people may find this a bit strong for their skin but it works really well on my acne prone skin. I have been pimple free with consistent usage of this and it also gives the skin a really nice glow. Even if I get any zits on my face, this product helps to shrink the zit within a few days. Will certainly repurchase this. I started using this product about 2 weeks ago, I picked it up because the price was so reasonable and I hadn’t tried the brand before. Well, I do not regret it. I have been using it once a day in the evening after cleansing then applying my usual night serum and the results have been amazing. I had a couple of age spots on my cheek and since using this lactic acid they have completely disappeared. The texture of my skin has improved dramatically, almost resurfaced and it’s glowing! I’m 30 so I had a few fine lines on my forehead and those have also gone thanks to this product. I don’t usually write reviews but I cannot recommend this formula enough. It isn’t drying so long as you use a serum or night moisturiser over the top. I certainly will be re-buying from this range and trying more products. This product has changed my skin completely, Ive never really had spots, only the occasional breakout. But, I've always struggled with texture and the little bumps on my skin that I just couldn't budge. However, this product as well with the retinoid 2%, they have magically transformed my skin. It has reduced the redness and improved my texture, making my skin soft, glowy and clearer. I use this everyday and I have recommended this to everyone I know. I'd heard of The Ordinary before - online and through friends and as it's such a good price, I thought I'd give it a try and mix up my skin care routine. SO glad I did. This lactic acid did feel a bit tingly at first to use, but I use it every night and I've got used to it. The first night I used it I woke up to smooth glowing skin, and my usual trouble areas (dry red skin around my nose) was significantly better. I'm using this every day and my whole face is smooth and clear. I also use it on my neck and décolletage. It literally clears dead skin and imperfections. I'll be buying more and more of this. I've been using it every other day for two weeks now over acne scars and it works.